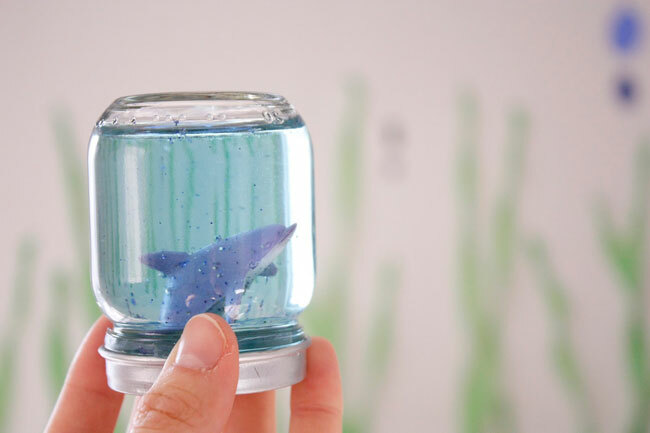 …snow globe aquariums! How fun are these! And pretty darn thrifty, too – the jars are empty baby food jars, and the sea animals and glitter inside the jars came from the Dollar Tree. Delia chose baby food jars because they’re a good size to use with the miniature-sized sea creatures. 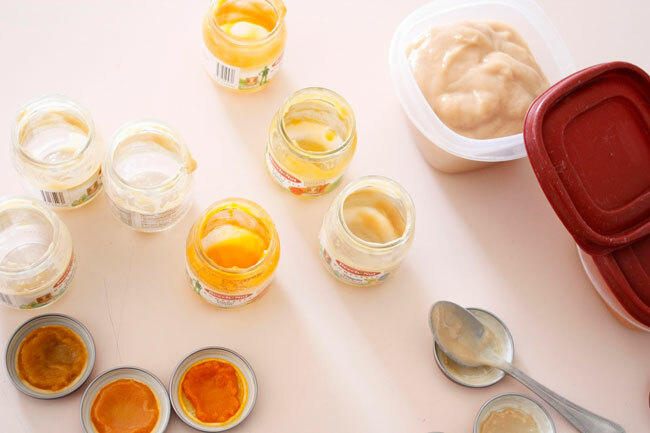 She emptied the jars out, then saved the baby food to use in her recipes (she says, “the bananas are a great addition to pancake batter. Squash, carrots and sweet potatoes are a great way to add more veggies to a plain spaghetti sauce”). But, of course, if you have a baby at home – score! I’m sure you have lots of jars on-hand already! Empty out the jars, then paint the lids silver (or another color of your choice) using acrylic paint. At the party, making the snow globes is easy! Have each child choose a sea creature they like. 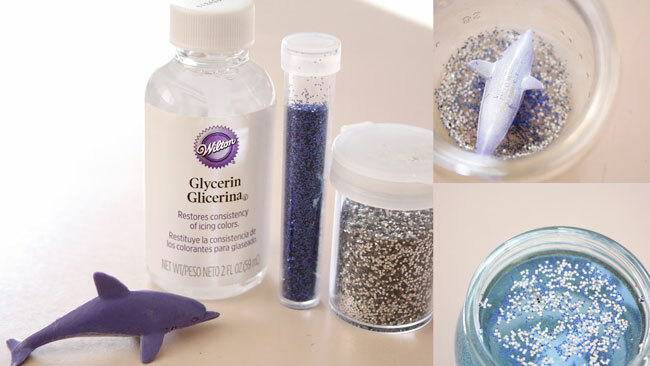 Then put their choice of critter into a jar along with some glitter and a little glycerin. Add the blue-tinted water, filling to the top. After the jars are full, hot glue the lids on. If you end up with a tight seal on the lid, you’ll be able to display the snow globe with the base down. As Delia says, “some lids took better than others. Owen’s is fine but Reid’s is leaking so we keep it upright.” But really, I think these would be super-cute either way! 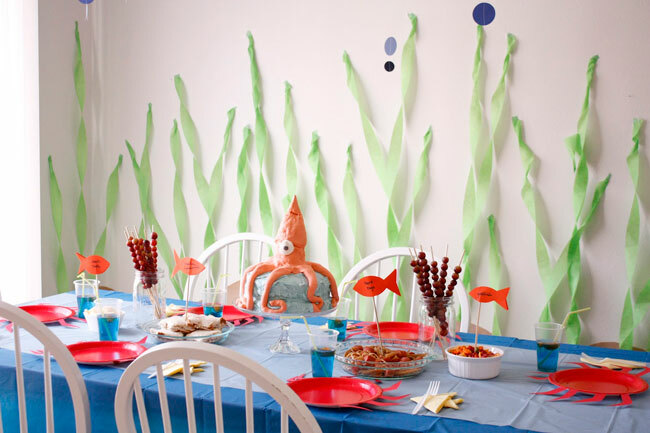 Be sure to check out the rest of Owen’s adorable Under the Sea party here – there’s lots more to see! Tutorial and photos are re-posted with permission from Delia Creates. Thanks Delia! Adorable! The party looks great too. I love the seaweed detail! I am planning our church's one week summer camp, which will have a different movie and bible verse each day. These snow globes will be a great activity before playing the Little Mermaid movie! Great idea and great low cost for a small church ministry. I'm so glad you like the idea! : ) Thanks Chanda! Love the green streamer idea for the seaweed going up the wall. We will be using that idea and adding fish and other sea creatures. Thank you! Hello! I'm hosting an "Under the Sea" themed party for my daughters 1st birthday in two weeks. 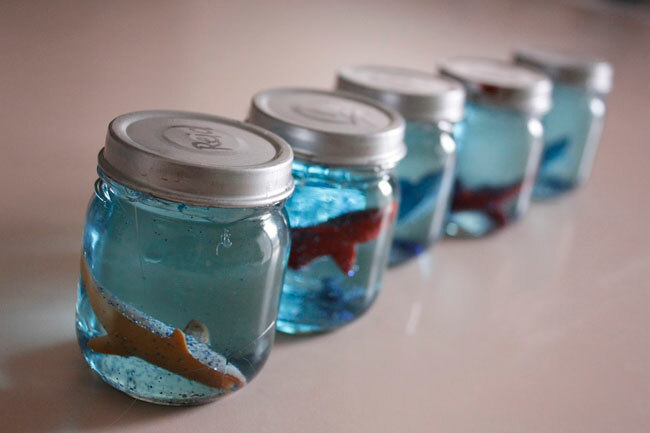 I love this idea and I already have all of the baby jars prepped, but I have not been able to find small sea creatures anywhere that are a reasonable price. They didn't have them at my local Dollar Tree. Has anyone found them elsewhere? I love this idea! So cute! How much Glycerin do you add to each jar before you add the water? Hi Rachel! Sorry, I'm not sure exactly how much to use - Delia just said "it doesn’t take much." Is the Glycerin necessary? What purpose does it serve?